When I came upon the idea that I wanted to stitch an Autumn scene that included a Scarecrow, I knew just the person to help me reach this goal! I suggested the idea of an exchange of talents to needle artist/mixed media artist Charlotte McDonnell, and she accepted the challenge. I suggested a number of items I would like to see in my painted canvas Autumn scene, which included a scarecrow, a wheelbarrow and some pumpkins. Charlotte took off with the idea, which includes the delightful scene you see here. In exchange for her artistic talents of painting the canvas, that I later stitched and embellished, I created several handmade Temari in Victorian Christmas colors for her. Kathy Fenchel worked with me to create a stitchguide. 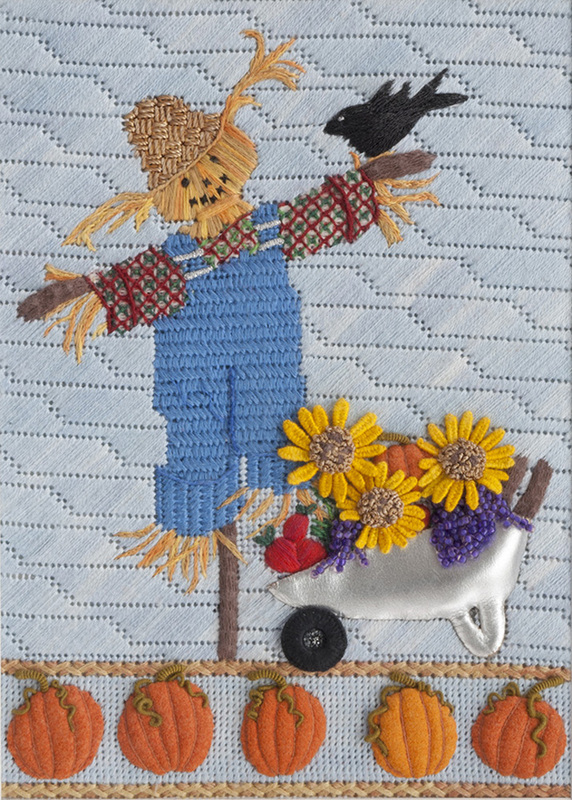 Scarecrow in the Autumn incorporates needlepoint stitches with surface embroidery, stumpwork, needlelace, bullion knots, French knots and beads, to create the dimensional stitched bit of Autumn that you see before you.